This is Bear #6, Freddy Bear. He was double-knit feet up inside out up to the sweater where I switched to dpns because the yarn is self striping. Sounds weird I know, but it was faster than double-knit right side out since there's all that yarn positioning to do. Now meet Charlie Bear. He was knit flat and seamed together. Why did I torture myself with the seaming? Because a friend of mine was talking about how relaxing she found seaming. Yah, about as relaxing as sitting on the beach during a hurricane. 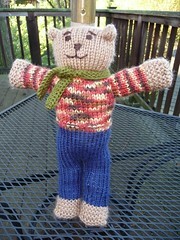 Anyway, I finished bears 4, 5 & 6 before I finally finished this poor guy. He doesn't even look right :-P Oh well. 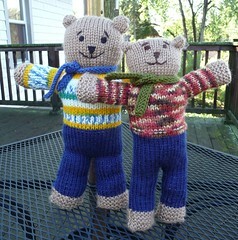 The bears knit in the round are larger than those seamed so there's more bear for your buck. 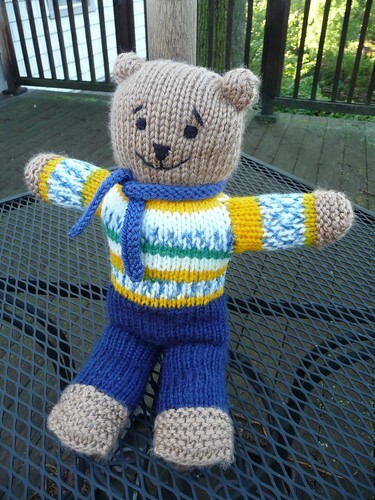 Although the ones I've completed with double knitting were done on size 2 circs and size 6 dpns for the sweater they are considerably larger than the bears totally knit in the round on size 7 dpns. The flat knit one, Charlie, is scrawny compared to Freddy who was in the round.